What Do These Laws Actually Do? In cities and states across the country, lesbian, gay, bisexual, and transgender (LGBT) people can be turned away from a restaurant, denied service at a hospital, or kicked off of public transportation simply for being who they are. 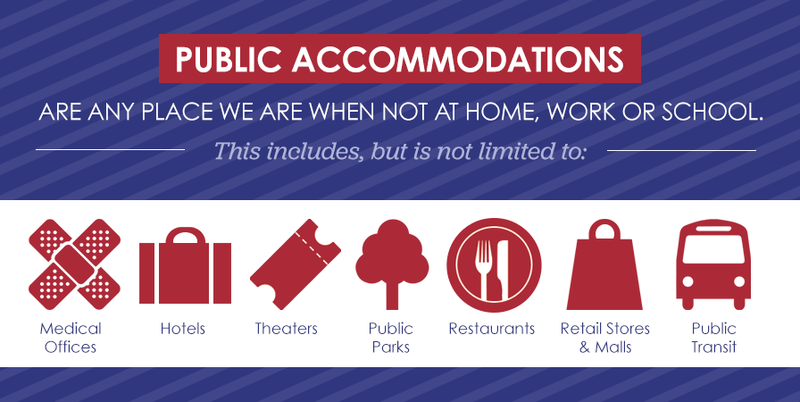 These areas are called “public accommodations,” which includes all the public places we conduct our lives when we aren’t at home, school, or work. This is especially true for the majority (53 percent) of transgender people who faced harassment or disrespect in public accommodations, according to one study by the National Center for Transgender Equality. Most Americans believe, however, that our differences makes us stronger and that we should treat each other with respect. Unfortunately, there are those who seek to deny LGBT people these protections. They intentionally spread lies and use scare tactics to mislead their communities about who transgender people really are. From cities like Anchorage, Alaska to states like Massachusetts, our opposition has promoted misrepresentations of transgender communities to deny all LGBT people the respect they deserve. 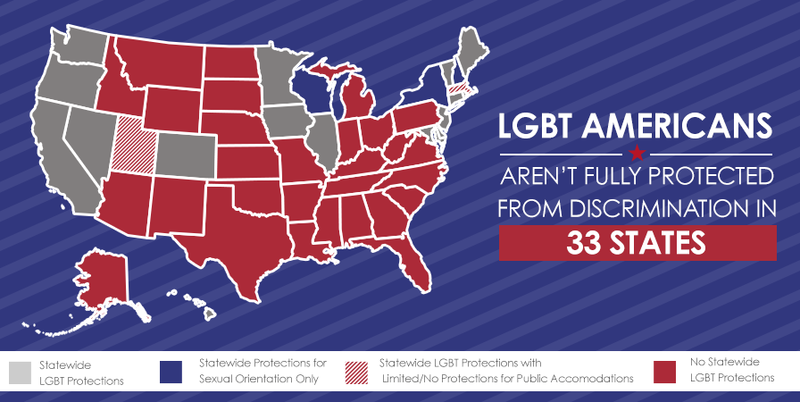 If we are to ensure all Americans are treated with respect and free from discrimination in public places, we must work harder than ever to update our nondiscrimination laws to include public accommodations. The nation’s leading Fortune 500 companies — 75 percent, according to the Human Rights Campaign’s 2016 Corporate Equality Index — prohibit discrimination on the basis of gender identity in order to recruit and retain the most talented workforce. These companies are ensuring that every employee feels safe and welcome where they work so that they can be the most productive employees. These businesses know that discrimination is bad for the bottom line. It is long overdue for cities and states to follow suit so that their economies can thrive. Protecting every American from discrimination is good for the economy. LGBT adults have a combined buying power of $884 billion dollars, and business leaders know that today’s generation of LGBT and ally consumers shop at businesses that support LGBT people. Ensuring places of business respect LGBT patrons helps businesses grow and makes our economy thrive. Allowing discrimination is bad for business. A recent report from the Indiana Competes coalition found that municipalities with nondiscrimination protections on the books received 83 percent of the new economic investments in the state since April 2015, and 58 percent of the new — mostly high-paying — jobs. Misrepresentations of transgender people have made a lot of Americans uncomfortable with public accommodations protections. Like all Americans, transgender people value privacy and security in all aspects of life, but most especially in the restroom. Transgender women are women and belong in the women’s room. Transgender men are men and belong in the men’s room. But the most important thing to know is that transgender people visit the restroom for the same reason as everyone else — to use it. And when they do, they want privacy, safety, and respect just like everyone else. Denying transgender people access to facilities to meet a need as human as using the restroom is a rejection of transgender people’s basic dignity. Inappropriate behavior by anyone in the restroom — transgender or not — is already illegal. Law enforcement officials in cities and states that respect transgender people’s right to access restrooms have not seen any increase in violence or harassment in restrooms as a consequence of updating nondiscrimination protections. Denying transgender people access to facilities to meet a need as human as using the restroom is a rejection of transgender people’s basic dignity. Public accommodations protections are at the heart of protecting anyone from discrimination, and they are about more than just restrooms. None of us would ever want to face discrimination or harassment in public spaces — where we eat dinner with family, buy gifts for loved ones, or take public transit to work. Today, 17 states, Washington, D.C., and over 200 cities nationwide have passed laws making sexual orientation and gender identity discrimination illegal in public accommodations — protections that already exist for women, people with disabilities, veterans, and people of color. By extending nondiscrimination protections to our transgender neighbors, we’re making sure everyone is treated with dignity and respect.